In 2010, as many as 270 militants were killed in action by security forces in Jammu and Kashmir. The number reduced to 119 in 2011. Security forces achieved major success in Jammu and Kashmir in 2018 as they eliminated top militant commanders including Lashkar-e-Taiba chief Naveed Jatt and also 260 ultras but nearly 100 soldiers had to lay down their lives in the line of duty. In 2010, as many as 270 militants were killed in action by security forces in Jammu and Kashmir. The number reduced to 119 in 2011. Then in 2012, 84 ultras were killed, 100 in 2013, 110 (2014), 113 (2015), 165 (2016) and 218 last year, the officials said. However, the successes notwithstanding, the year gone by was one of the bloodiest for the security forces as they suffered the highest number of fatalities than in any other year in the past decade. Last year, 95 security forces personnel were killed, while 83 personnel were killed in 2017, the officials said. The number of civilians killed in violence has also been higher in the year gone by. As many as 86 civilians were killed in militancy-related violence - whether in actions by militants or in cross-firing between the ultras and the security forces or in security forces' action on protestors during clashes. The year also saw a unilateral 'ceasefire' announced by the Centre in terms of non-initiation of combat operations during the fasting month of Ramzan in May-June. While mainstream political parties and the people, by and large, welcomed the move, the militants rejected the ceasefire. The ceasefire, however, was not extended beyond the month of Ramzan even as it had brought respite to the people. 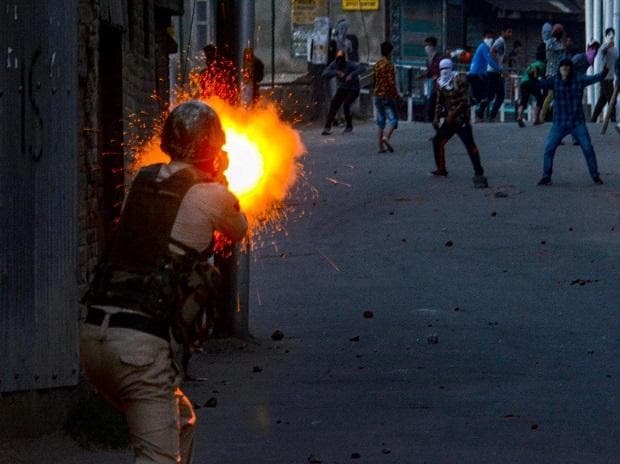 Violence in 2018 started early when on January 6, four policemen were killed and two others were injured in an Improvised Explosive Device (IED) blast set off by militants in Sopore town in Baramulla district of north Kashmir. The number of militant fatalities in a single month in 2018 was highest in November when 40 ultras were killed by the security forces. In the second half of the year in the four months of August, September, October and November - the security forces went on an overdrive, killing 130 militants, including several top commanders of various outfits. Earlier in the year, on May 6, security forces achieved a major success when Hizb-ul-Mujahideen (HM) commander Saddam Padder was killed along with four other ultras, including an assistant professor from Kashmir University Mohammad Rafi Bhat, in an encounter in Badigam village in Shopian District. Bhat's life as a militant lasted less than 36 hours after he had gone missing on May 4 and had joined the HM. While the militancy-related violence continued in Kashmir throughout the year, it took an ugly turn on June 14 when senior journalist and Editor-in-Chief of Rising Kashmir daily newspaper, Shujaat Bukhari, and his two personal security officers were shot dead by unidentified gunmen outside his office at Press Enclave here. Police said Lashkar-e-Toiba (LeT) was involved in the journalist's killing and its Pakistani commander Naveed Jatt executed the plan. Jatt, who had escaped from police custody at SMHS hospital here on February 6 when he was being shifted from the Central Jail, Srinagar, for treatment, was later killed in an encounter with security forces on November 28. On October 11, HM suffered another setback when its top commander Manaan Bashir Wani was killed along with his associate in a gunfight with security forces in north Kashmir's Handwara. Outstanding in studies, 27-year-old Wani, who quit PhD studies in Allied Geology to join the militant ranks in January earlier in the year, had his basic education in Jawahar Navodya Vidyalay and Sainik School Manasbal. He was considered to be chief recruiter for militants in north Kashmir area following elimination of some of the top ultras in the region over the past two years. Less than a week after Wani's killing, LeT's top commander and one of the oldest surviving militants, Mehraj-ud-Din Bangroo, was killed in a gunfight in Srinagar's Fateh Kadal locality on 17 October. The militants also targeted security forces throughout the year and continued with decamping with the weapons. The ultras also intensified attacks on alleged informers, abducting and killing several of them and on many instances, released the videos of their execution.